Don't you love it when you're surprised by something that makes you smile? Most of us do. As a business, you have lots of opportunities to make your customers happy. Perhaps even surprise them with something they didn't expect. But, do you do it? This is the Christmas card we received from Send Rover Over, Bella's groomers. I love the personal touch...they must have taken the photo when I brought her in last month! So, here's Kristen taking in her dog for a grooming and completely unaware that the folks at Send Rover Over are secretly taking Bella's photo for a special Christmas card. First off, kudos to SRO for even sending their clients a holiday card. 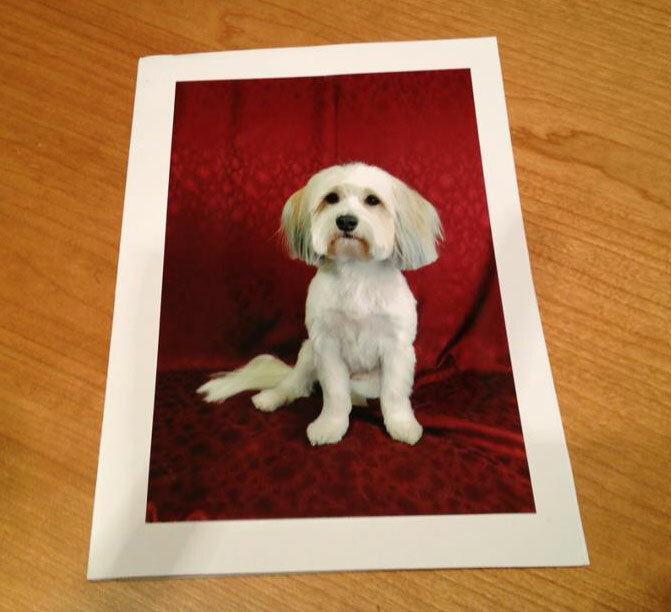 But, to make it so personal as to put a photo of the client's dog on the front of the card? Now, that's the kind of thoughtful gesture that, I'm sure, makes clients want to come back again and again. I know I'd go to Send Rover Over if I lived in Eugene. If there something your business can do to surprise and delight your customers? Make them feel special? Put a smile of their faces? Think about it. Now do it. That is such a good idea! Would definitely earn my loyalty as a customer. That's adorable and I would be a customer for life. Such a little thing, but I'm always impressed when a small idea like this becomes a reality. Probably because I generally have trouble making my own "small-but-good" ideas become a reality. It does make me wonder what in the world I could do that's similar and as awesome as this. About the best I can come up with is when I created my Wolfy logo and customized a copy for each of my readers who requested one with their name on it. They use those graphics as their Facebook profile pics. While personalized, it wasn't really a surprise.